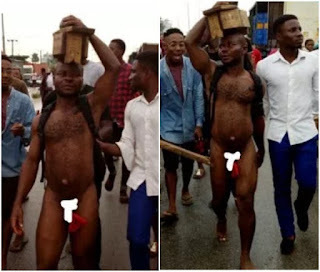 A Nigeria man whose name was withheld and a father of three (3) was caught in the early hours of today at the verge of buring what looks like a charm at his ex girlfriend's residence in Oginigba, Port-harcourt. Passersby who saw what was happening seized him and was stripped naked parading the neighbourhood unclad. Though we are yet to come to terms while he did what he did..